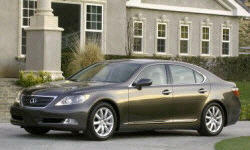 On febuary 19th i purchased a used 2008 lexus LS 460 with 102,000 miles. Shortly after the purchase i noticed that sometimes the car would idle rough mostly at a stop light or stop sign. I have tried a few remedies ( change spark plugs, air filter, fuel injector cleaner twice and had the throttle body cleaned). Nothing seems to work, is this common to this particular year and model? I have a 2009 LS460 and have not had any problems with engine at idel speed. The car has 56,000 MI.